Product #21220 | SKU 048493 | 0.0 (no ratings yet) Thanks for your rating! The Rycote XLR Holder Mk II fits between any 3/8" male threaded boom pole or mic stand and any 3/8" female microphone shock-mount or windshield system. 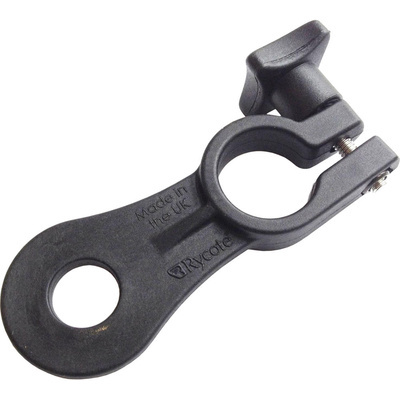 The holder securely grips all XLR connectors, at a set distance from the side of the pole to prevent the XLR plug from becoming unclipped or making noise. The XLR Holder Mk II is also strong enough to support the fitting of most standard plug-on transmitters. It's made from a metal replacement polymer, developed in the automotive industry for SUV door handles. The material is stiff like a metal, but it also features a rubber additive to reduce brittleness and a UV stabilizer to prevent breakdown in UV light.